Published in the June 2011 NAWCC Bulletin, starting on page 330. The Graham deadbeat escapement is found in a wide variety of clocks, including most of the Vienna Regulators and Precision Regulators seen in my shop. With time the escapements pallet faces become grooved from sliding across the tip of the escape-wheel teeth. Over the centuries this grooving can convert a deadbeat escapement to a recoil escapement. Interestingly, when this happens the clock often continues to run, perhaps a tad fast, but run none the less. While hardened pallets wear at a slower rate than softer pallets, eventually they all develop grooves, unless of course one is lucky enough to own a clock with jeweled pallets. My methods for dressing grooved pallets are discussed in a previous Technical Tid Bit (see the April 2010 Bulletin, page 191 for Tech Tid-Bit 4). 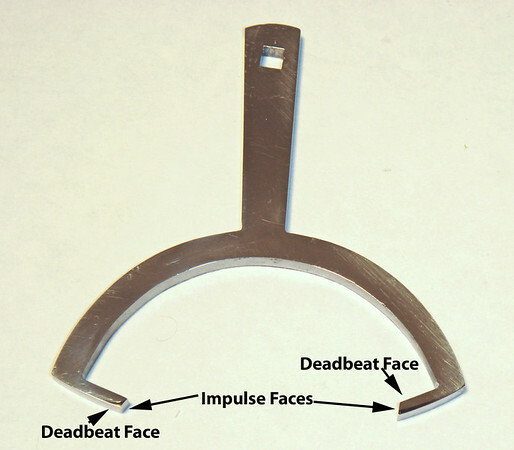 While it would be nifty to be able to remove the groove without changing the distance between the pallets on a single-piece anchor (see Figure 1 for a typical Viennese single-piece anchor), grinding and polishing pallets open the gap, which changes the degree of lock on the deadbeat pallet face (see Figure 2 to better understand where the locking (deadbeat) and the impulse pallet faces are on a typical Viennese deadbeat anchor).